Locally-produced Lifestyle shows are showing how it’s done on Foxtel lately, scoring in Subscription TV ratings. Embarrassing Bodies Down Under, Paddock to Plate and Grand Designs Australia all topped the STV ratings last week on their respective nights. All three air on the LifeStyle channels. Embarrassing Bodies Down Under rated 70,000 as the top-rated STV show on Tuesday night. 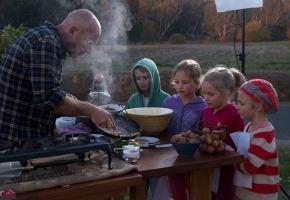 On Wednesday night Matt Moran’s new series Paddock to Plate was #1 with 82,000. And on Thursday night, perennial favourite Grand Designs Australia pulled 142,000 viewers. Numbers for all shows will rise with replays and Timeshifted viewing, but these are good results for local product and the production companies Shine Australia, ITV Australia and FremantleMedia Australia. @r2thez, that feels like something Peter Maddison would say…..
Grand Designs Australia is by far the best locally made show on tv, Peter Maddison does a fantastic job at hosting a show that is just great television. Well done to them. @ David Knox – Embarrassing Bodies is on LifeStyle You, not The LifeStyle Channel.